View while doing the Nature Walk right next to the Montage Kapalua. Wearing a Reformation dress, this bag and these shoes. 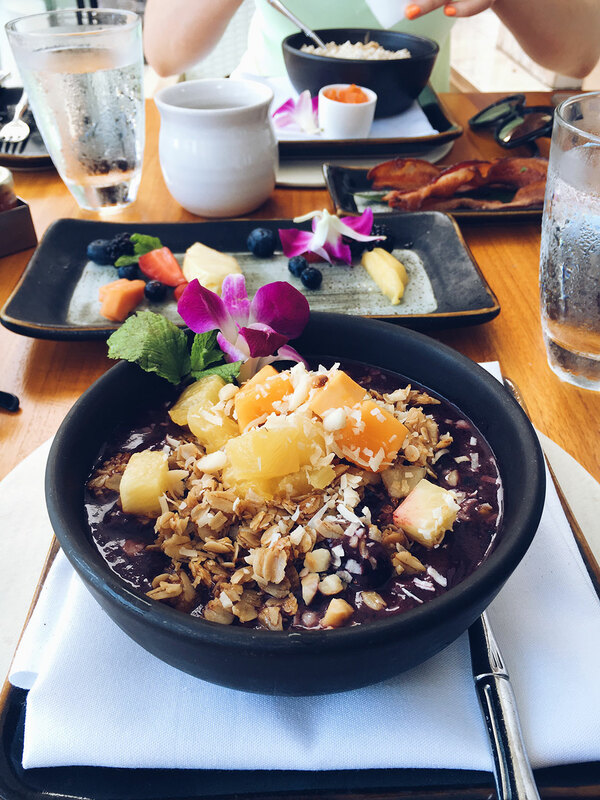 My Acai bowl from breakfast at Cane & Canoe at the Montage Kapalua. The view walking down to Mama’s Fish House. 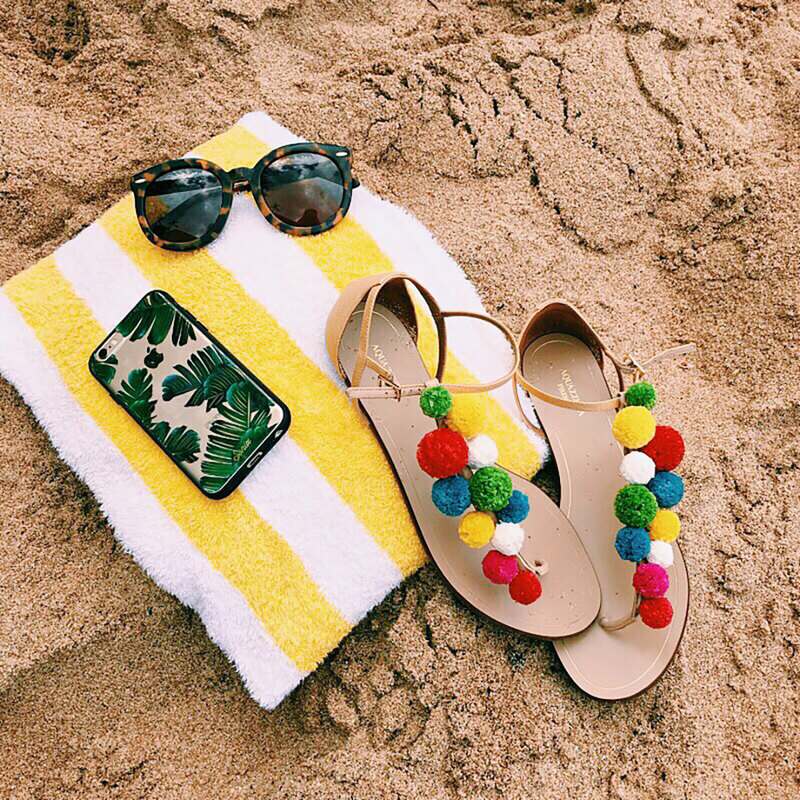 The most adorable pom-pom sandals, palm-print iPhone case and my favorite Karen Walker sunnies. The beach in front of Mama’s Fish House. Wearing an old off-the-shoulder top (nearly identical style here), boyfriend shorts, and these shoes. View from the Beach Club pool at the Montage Kapalua. 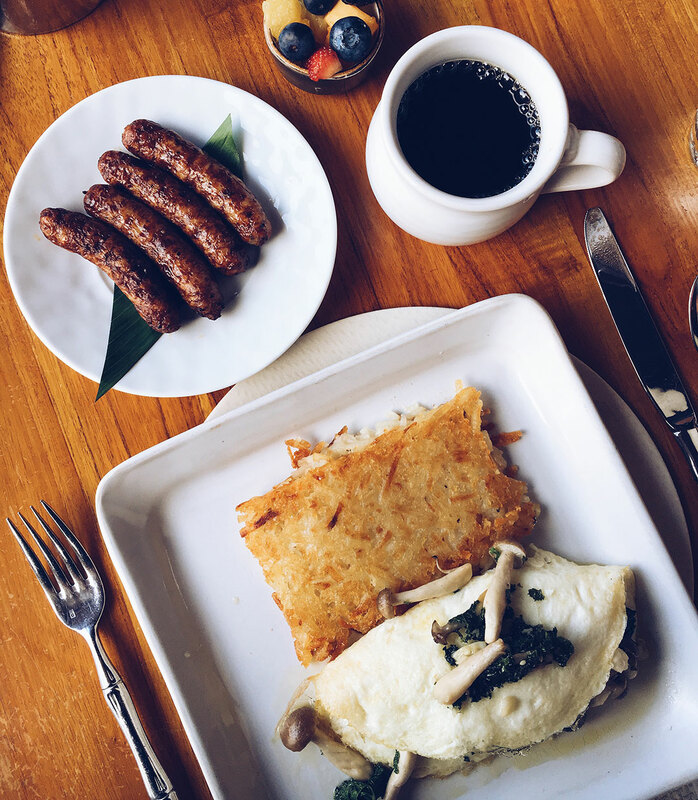 The Cane & Canoe omelet at the Montage Kapalua. View from the beach in front of the Montage Kapalua. 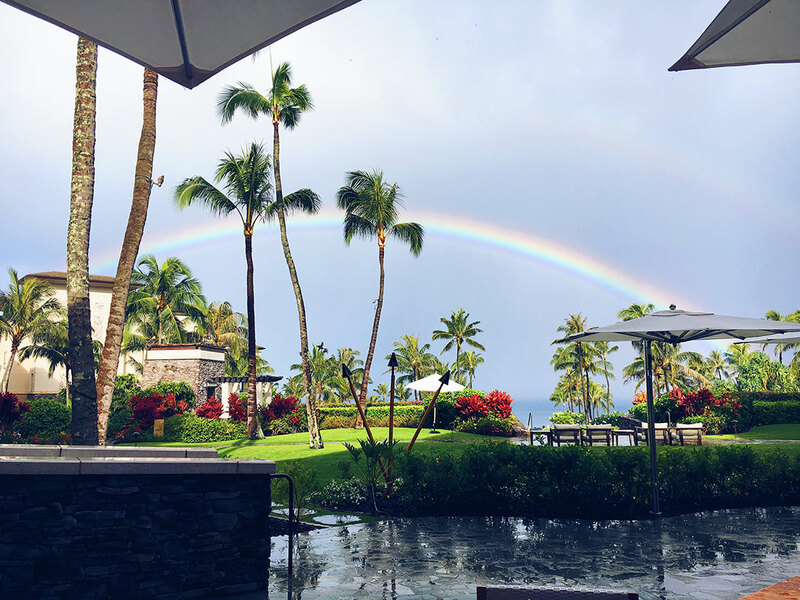 We saw many rainbows throughout our stay at the Montage Kapalua, but on this morning we witnessed a double rainbow from our table at Cane & Canoe! Wearing my favorite Rebecca Taylor dress (now on major sale!!). 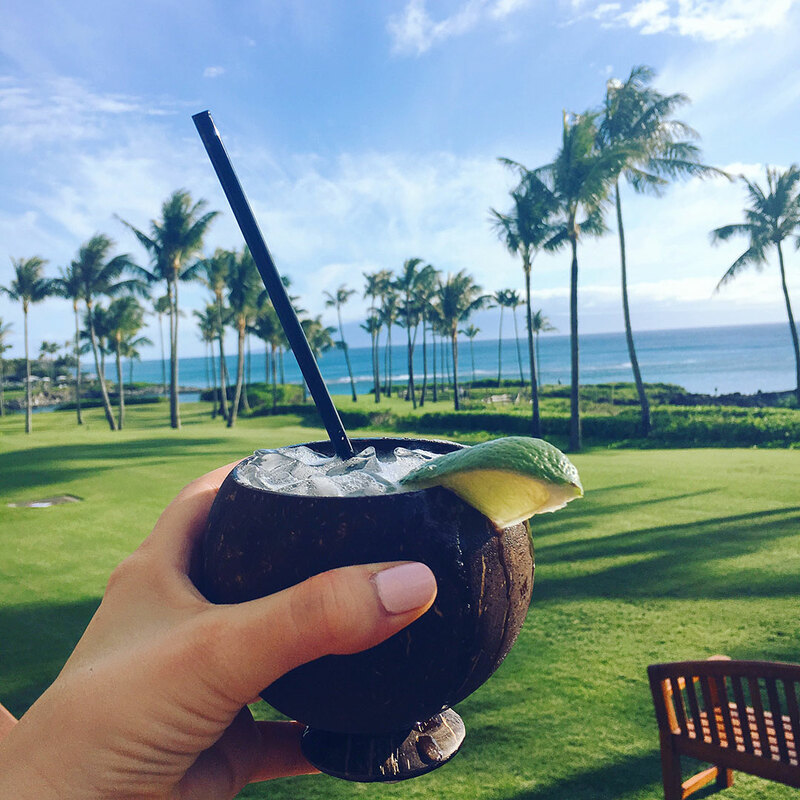 The “Lime in da Coconut” drink at the Montage Kapalua pool – YUM! As I’m sure you saw last week, I flew to Maui for five days to celebrate my friend’s wedding! It was a magical weekend, albeit short. I wish I could’ve stayed a few days more, but that just means I’ll have to plan a trip back! We stayed at The Montage Kapalua which was absolutely fabulous! We honestly barely left the hotel, because they had everything right there: a luxurious pool, great food and drinks, a nature walk nearby, and a small beach right in front of the hotel featuring a variety of water activities (I snorkeled!!). 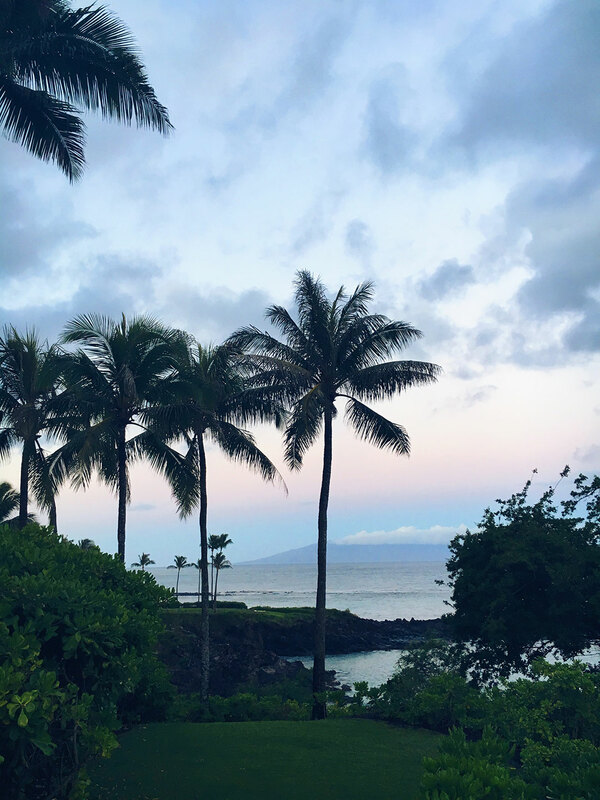 Read on to check out my recommendations from our stay in Maui! The Montage Kapalua – I don’t have anything bad to say about this hotel. It was originally built as residences, so they have these three bedroom villas which are perfect for a group of friends or large family traveling together! They come with a giant kitchen and living space, so you can store groceries, cook, entertain and more. Most people stay longer than we did, which makes these villas super useful. The hotel restaurant, Cane & Canoe, is open for breakfast and dinner, and then you can grab lunch poolside. Both menus are excellent! In addition to the pool bar for daytime, they have a separate bar located next to Cane & Canoe dedicated to happy hour and evening. Just a few steps from the pool area you’ll find a nature walk/trail (to the right of the hotel) and a small beach (to the left). SO many great activities are just seconds away from your hotel room. It’s awesome! 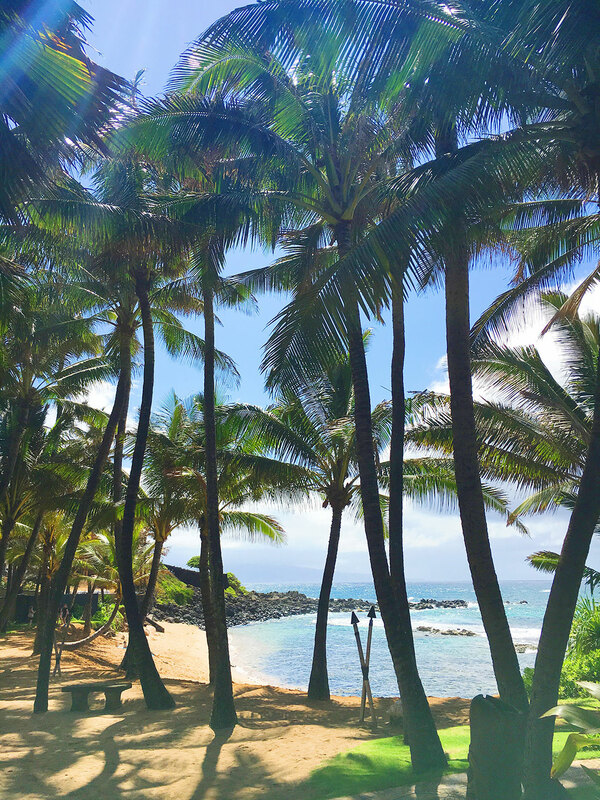 The Ritz-Carlton Kapalua – just up the hill from The Montage you’ll find The Ritz! If you aren’t bringing the kiddos, this is the place to go. It’s very adult-friendly, quiet and serene. The Ritz has an amazing pool, but there is limited beach access (if that’s something you wanted to do)! There are some amazing in-house restaurants (Kai Sushi, The Banyan Tree, and Burger Shack to name a few) and daily live music in the evenings. If your boyfriend/hubby loves to golf, you can’t beat the proximity to the course. 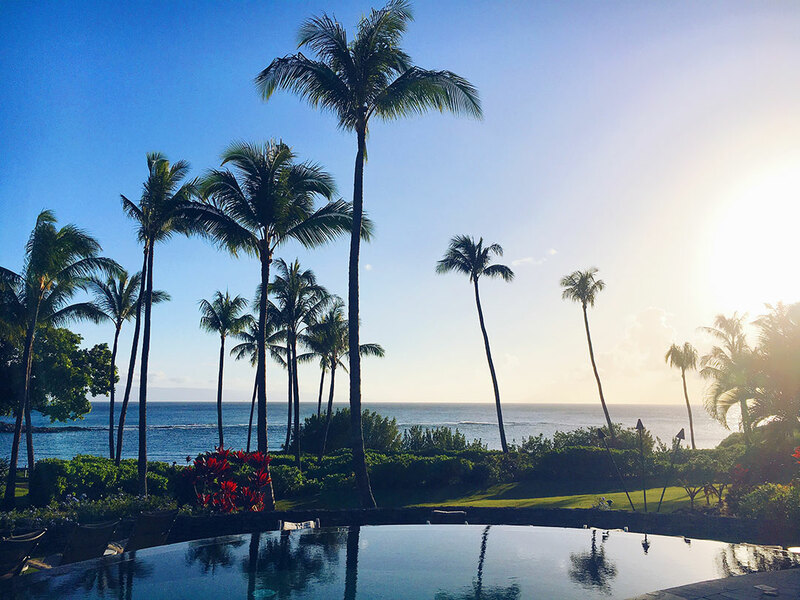 Four Seasons in Wailea – I didn’t get a chance to visit this part of the island, but my friend Courtney speaks very highly about this hotel (she’s stayed a number of times). The Four Seasons is situated on the other side of Maui from Kapalua in Wailea. Unlike The Montage, this hotel features private beach access just steps from your room. There are several five-star restaurants within the hotel, so you’ll certainly never go hungry – Ferraro’s is fantastic for lunch and dinner, and Duo has a great buffet-style breakfast. Poolside food/drink service is on point and there’s also a poolside spa service! If you’re looking for a little entertainment, the Four Seasons has live music and hula dancers in their bar every evening! Mama’s Fish House – I received SO many recommendations for this place! Mama’s Fish House was established in 1973 and has been an island staple ever since. This spot is about 10 minutes from the airport, so it’s about an hour and 20 minute drive from the Montage – you sort of need to make a day out of it since you’re traveling across the island. 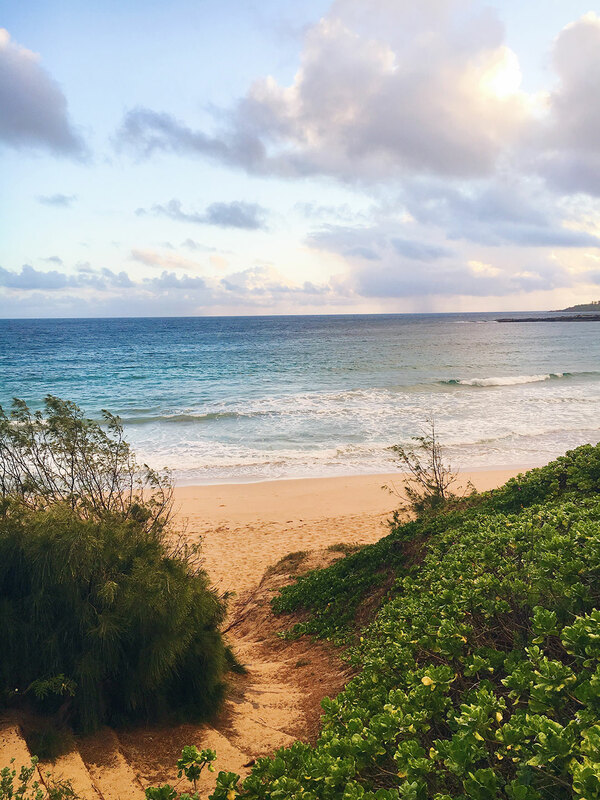 You drive through the eclectic town of Paia to get to the restaurant and are near some cool local surf spots, so there’s plenty to do in that area if you need to kill some time before or after your meal. I should tell you that this place is NOT cheap. Each entree hovers around $50, so just go in knowing you’ll be spending a lot. With that said, it’s the freshest seafood around and the dishes are inventive as they are delicious. Sansei – on our first night in Maui we were all craving something light, so we hopped over to Sansei for sushi. This spot is a very short drive (like 3 minutes) from the Montage and walking distance from the Ritz. Great, fresh sushi and a lively ambiance. They even have karaoke night for those of you who are bold drunk enough. 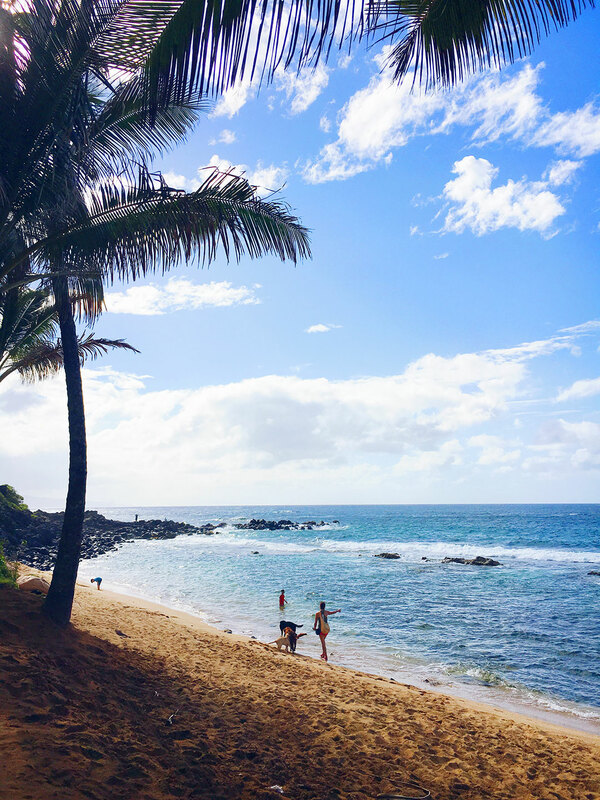 Merriman’s – this spot is just a short walk to the other side of the small beach from the Montage Kapalua. It’s where my friend and her fiance had their rehearsal dinner and it was stunning! It’s situated right on the water, so it obviously has gorgeous views. While we didn’t hit Merriman’s on a typical night, the food for the rehearsal dinner was fabulous! This is a perfect spot for date-night dinner on your vacation! Cane & Canoe – this little eatery can be found just above the pool area at The Montage Kapalua. I ate here every. single. morning. Not only was it convenient, but the menu was mouth-watering and had island flair to it. On one day I ordered the Acai bowl topped with tropical fruit and shaved coconut, the next I ordered an egg-white omelet with kale, garlic, mushrooms and feta, on another I ordered the local rice bowl (basically fried rice with sausage, fried eggs, bacon, bell peppers and scallions), and on the last day I ordered the gluten and dairy free almond + blueberry pancakes. Each and every one was amazing!! I never went to Cane & Canoe for dinner, but I’m sure it rocks. It also doesn’t hurt that Cane & Canoe has a perfect view. Lahaina Grill and The Plantation House – I didn’t have a chance to visit these two, but my friend Natalie who goes to Maui constantly recommends both of these spots! Beach + Water Activities – The Montage Kapalua pool was amazing, but since we were in Hawaii, our group wanted to spend a couple days on the beach too. We wanted to feel the toes in the sand, enjoy the ocean breeze and partake in a few water activities! Right below the hotel you could rent out snorkel gear, paddle boards and kayaks – I opted to snorkel! It was amazing!! You don’t have to go out far at all to experience all the sea life – I saw two giant turtles just a few feet from the shore! They got so close, I swam away out of fear – it’s surreal! There were so many beautifully-colored fish and eels (they stayed along the floor). Definitely worth it if you have time! 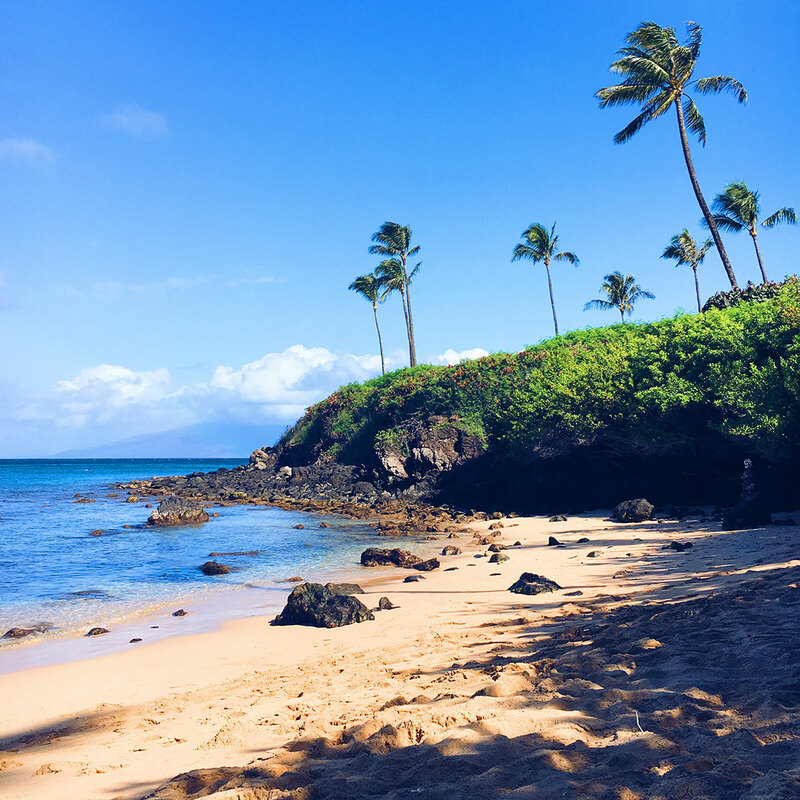 Hike – there are several amazing hiking trails in Maui, so if you’re up for an adventure (and a little exercise) block off a few hours one day to get a hike in. While the Nature Trail next to the Montage was pretty, it certainly wasn’t strenuous or very long – perfect for an easy morning walk along the water! For more serious hikers, try one of these three hikes. The Road To Hana – we didn’t have time to do this, and I’m not sure I would have anyway (read on to find out why). The Road To Hana is 64.4 mile long stretch along the coast of Maui – it features some of the most beautiful views you’ll find anywhere of the ocean, cliffs, beaches, waterfalls and rainforest. The issue I have with it is the very narrow, winding roads, and the steep mountains you’re driving on – I’m a control freak, and this just sounded like I’d be stressed out the entire drive. If you’re a more brave soul than I, definitely do it! Spa Montage – on my last morning at The Montage, I visited their award-winning spa for a little “me time”. Upon arrival you are checked in with some fresh pineapple water (YUM), and if you are having a treatment/massage, you get select the scent used in the oils/scrubs to customize your treatment. There happens to be a private spa pool, sauna, steam room, hot tub, and cool rain shower – who can turn that down? I selected to have my massage in one of the outdoor cabanas. It was lovely! Such a fun guide. We loved Mama’s Fish House when we went. Awesome recommendations! I’ve actually never been to Maui. Love these recommendations! We’re headed to Maui in September and staying in Kapalua at the Ritz-Carlton. I suspect your restaurant picks will come in handy! These photos are all so gorgeous, Merritt! My favorite part is always your outfits:) I adore that black off the shoulder top! So gorgeous. Thanks for sharing, darling.